Before we get to the interview with Vic and Dan, I’d like to thank Cathy for being brave enough to have Victor over. Not everyone is willing to deal with his mouth, and for that I commend Cat highly. I did have a long talk with Mr. Kalinski before handing over the list of questions, and he promised to be nice. You can take that with a grain –or pound- of salt. Since Dan is riding shotgun I wager he’ll keep his husband in check. Blurb- Victor Kalinski and his husband, Dan Arou, are living the dream. Married for over a year now, the couple have settled into life in Cayuga surrounded by friends, family, and a team that’s poised to make another championship run. Each man is enjoying professional success as well as personal bliss. Who knew life in the suburbs with a spouse and a child could be so darn satisfying? Not Vic. K, that’s for sure. The happy times are about to turn rough, though. The Cougars have picked up a new player, Sander March, a brash young center whose sass, skill, and attitude can rival Victor’s. When it’s revealed that this new player and Dan have history, tensions begin to rise between the newlyweds. As Victor and Dan work on those issues, the one person Victor never thought he would meet arrives in the small New York hamlet and proceeds to flip everything in Vic’s life upside down. Can Victor and Dan’s marriage withstand what life is about to drop on it, or will the challenges be too much for them to handle? Before you read this you do need to read the Point Shot Trilogy which is Dan and Victor’s story. Coach’s Challenge brings us back to Vic and Dan after they’ve been happily married and fathers for nearly two years. Everything is going great then Vic is thrown not one but two monkey wrenches into his life. one that shakes up his marriage the other he is brought face to face with the father that abandoned him. Hate isn’t a strong enough word for how Vic feels about his father and if you’ve read any of Victor’s stories you know how he deals with things and how he speaks his mind. V.L. 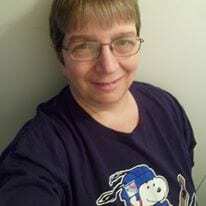 Locey loves worn jeans, yoga, belly laughs, walking, reading and writing lusty tales, Greek mythology, Dr. Who, Torchwood, the New York Rangers, comic books, and coffee. (Not necessarily in that order.) She shares her life with her husband, her daughter, one dog, two cats, a flock of assorted domestic fowl, and two Jersey steers. Thanks for stopping by LeeAnn. I love Coach’s Challenge too. LOL! I LOVE Vic and Dan! Thanks for hosting them, Cathy! Thanks for stopping by Angie. I hope to see you back! This interview was hilarious! I know what books I will be digging into after I finish Ready Player One. I’ve got to read these. Great job, Cat, and Vicki. This sounds amazing and I can’t wait to catch up on your writing journey. That was perfectly hilarious and so very…..Vic & Dan! Thanks for doing the interview! Thanks for stopping by! I hope to see you back!